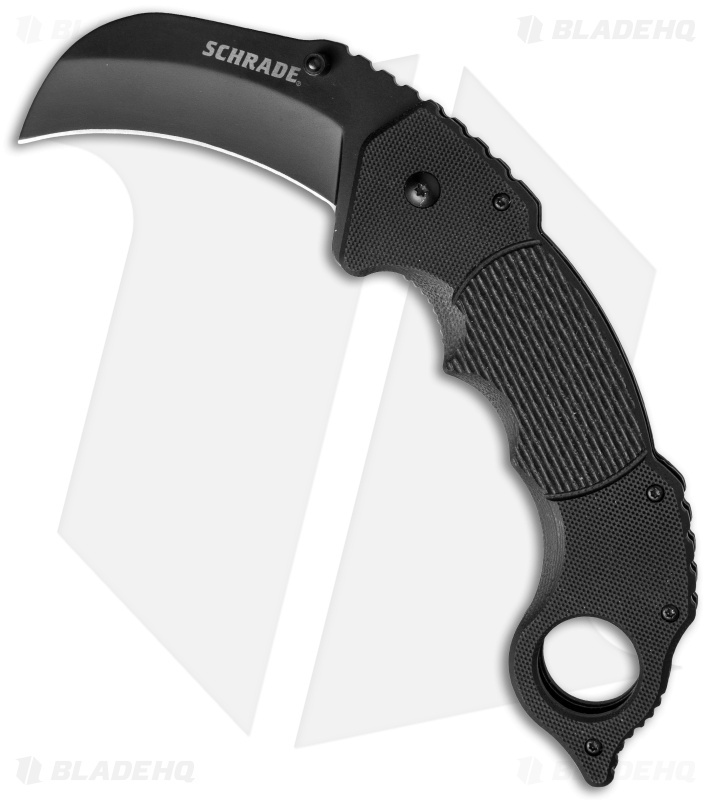 This particular blade by Schrade includes a 9Cr18MoV steel hawkbill blade that has a black powder coat. It also has ambidextrous thumb studs for opening, and a liner lock to hold the blade securely in place. 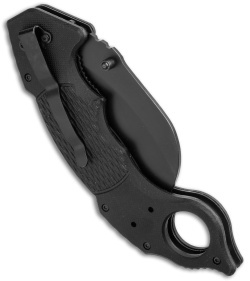 It has the traditional finger hole and curved handle with finger grooves, and also offers textured black G-10 handle scales. It includes a reversible tip-up/down pocket clip for easy carry. The karambit style knife was originally created in the Asian Pacific islands, specifically Java, as weapon of self-defense. There, it is known as the Kuku Macan, which translates to "Claw of Pamacan" or "Claw of the Great Tiger." It's distinctive curved shape is a clear representation of the tiger's claw. Today, the blade is used not only for self defense, but as a utility knife, a camping and hunting blade, and in different forms of martial arts. Just got this knife in the mail, surprised how big it actually is.came sharp right out of the box, no blade play when opened, wish the hole was bigger but still a great buy for the money! Very satisfied with knife and the promptness of blade hq. Blade hq has a new customer for life. Good starter knife for a Karambit. Smooth opening knife. Handle a little uncomfortable. Wish the pocket clip could be switched to the opposite side.The current configuration does not allow for an efficient withdrawal from the pocket in a self defense reaction. I will carry it in my pocket without using the clip.